Motown the Musical opened in the West End’s Shaftesbury Theatre in London (preview screenings in February 2016 and red carpet opening event on 8 March 2016). It was a Broadway hit in 2013 and there has been much anticipation for its arrival in the UK. I had the opportunity to attend the show. It is a sing-along-sensation, with hit Motown songs like Marvin Gaye’s What’s going on?, My Girl, My Guy, Super Freak, Baby Love, Mercy Mercy Me, Aint no Mountain High Enough and the Jackson 5’s ABC to mention just a few. The stellar cast includes a South African actor, Sifiso Mazibuko in the role of Marvin Gaye. My exclusive interview with Sifiso Mazibuko made the front page of SApeople.com, an expatriate publication for South Africans abroad. My theatre interview/review was published on 21 March 2016. 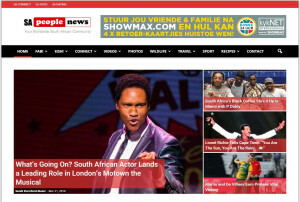 It also made the homepage of the SApeople website that week. Please read my article online or download the pdf by clicking on the thumbnail image alongside.